Sempra LNG & Midstream developed the first LNG receipt terminal on the west coast of North America, Energía Costa Azul, in Mexico and Cameron LNG near the Gulf of Mexico. Total is a major energy player committed to supplying affordable energy to a growing population, addressing climate change and meeting new customer expectations. Mitsui has a significant global LNG portfolio and strong relationships with major LNG buyers spanning more than 40 years. The company holds equity interests in LNG production facilities that operate in seven countries. Mitsubishi Corporation is a highly experienced LNG developer and investor and has a significant global LNG portfolio and strong relationships with major LNG buyers. NYK is one of the largest shipping companies in the world. It operates 846 major ocean vessels, as well as fleets of planes, Trains, and trucks, including 28 LNG carriers. 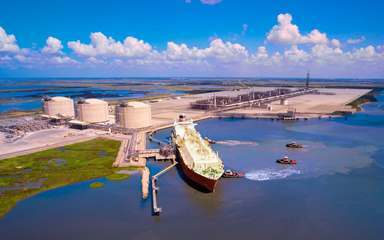 Sempra LNG & Midstream develops and builds LNG receipt terminals, liquefaction facilities and integrated midstream natural gas infrastructure and is active in the sale of LNG worldwide. Sempra Energy, based in San Diego, is a Fortune 500 energy services holding company with 2016 revenues of more than $10 billion. The Sempra Energy companies have more than 16,000 employees and approximately 32 million consumers worldwide. Mitsui & Co. is one of the most diversified and comprehensive trading, investment and service enterprises in the world, with 139 offices in 66 countries as of September 2017. Utilizing global operating locations, network and information resources, Mitsui & Co. is are multilaterally pursuing businesses that range from product sales, worldwide logistics and financing, through to the development of major international infrastructure and other projects. They are active in the following fields: Iron & Steel Products, Mineral & Metal Resources, Infrastructure Projects, Integrated Transportation Systems, Chemicals, Energy, Food Resources, Food Products & Services, Consumer Services, and Innovation & Corporate Development Business. Mitsui & Co. is actively taking on challenges for global business innovation around the world. Mitsubishi Corporation (MC) is a global integrated business enterprise that develops and operates businesses across virtually every industry including industrial finance, energy, metals, machinery, chemicals, foods and environmental business. MC’s current activities are expanding far beyond its traditional trading operations as its diverse business ranges from natural resources development to investment in retail business, infrastructure, financial products and manufacturing of industrial goods. As of March 2017, Mitsubishi had over 200 offices and subsidiaries in some 90 countries worldwide and a network of approximately 1,200 group companies, and employs a multinational workforce of over 68,000 people. Those commitments guide what we do. With operations in more than 130 countries, we are a global integrated energy producer and provider, a leading international oil and gas company, and a major player in low-carbon energies. We explore for, produce, transform, market and distribute energy in a variety of forms, to serve the end customer. Our 98,000 employees are committed to better energy that is safer, cleaner, more efficient, more innovative and accessible to as many people as possible. As a responsible corporate citizen, we focus on ensuring that our operations worldwide consistently deliver economic, social and environmental benefits. Our ambition is to become the responsible energy major. Nippon Yusen Kabushiki Kaisha (NYK) is one of the world’s leading transportation companies, and has worked to ensure safe operations for over 132 years. NYK’s revenue in fiscal 2016 was ¥1,924 billion, and as a group, NYK employs about 50,000 people worldwide. Tokyo-based NYK has regional headquarters in London, New York, Singapore, Hong Kong, Shanghai, Sydney, and Sao Paulo. Japan is currently importing LNG mainly from the Middle East and Southeast Asia. LNG imports from the United States will contribute to diversification of energy resources and increase flexibility of energy supply.